Bog plants are an interesting group that adapted to live in perpetually wet soil. 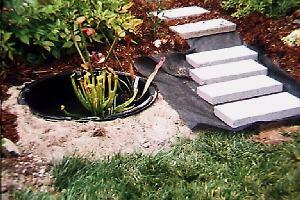 Here is a simple project you can do to create bog-like conditions for plants that thrive with their roots submerged in water. If you can not find the container I used, use similar containers without drain holes. This project takes less than a day to finish once you have the container, plants, and soil. I purchased a shallow whiskey barrel liner from a local nursery for $14.99 (1999 prices). I don't know how long it would last, but a rigid, shallow, child's swimming pool could be an alternative. 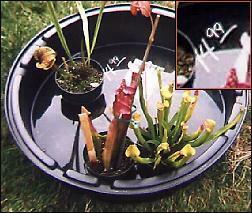 I selected three Sarracenia varieties, ranging from 7 to 10 dollars each. The peat moss I used to mix with garden soil was leftovers from a previous owner. I dug a hole to accommodate the depth and width, and sunk the liner to the rim in an area where people wouldn't accidentally step on it. Sand at the bottom of the hole made it easier to level, so I dug a little deeper. After throwing in some sand and tamping it down, I dropped the container in. With a spirit level, I made a few adjustments with the sand to even it out. The planting soil I made by mixing one part peat moss to one part clay garden soil. The Sarracenias went in at the same level they grew in their pots. After filling the miniature bog with water, I topped it with moss, which effectively hid the container. 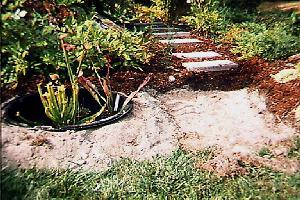 I had another option — sink the container deeper in the ground then backfill with soil to ground level. However, ground level placement made it easier to monitor the water level. 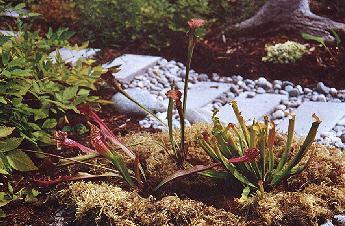 A tiny bog garden can be position anywhere in the garden. Select bog plants that meet the same light requirements as the position of the bog. Moving the bog is easy. Simply lift the container (with the help of another person) and move to a new position. If you have a heated greenhouse, select tender bog plants. Bring the container inside the greenhouse for the winter months. 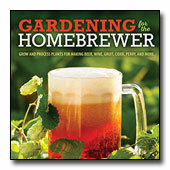 There you have it — a simple garden project you can do in less than a day. Then you can have fun spending the rest of the season refining it. This bog garden contains three varieties of Sarracenia (pitcher plants) — Sarracenia rubra wherryi, Sarracenia flava x alata, Sarracenia leucophylla x purpurea.